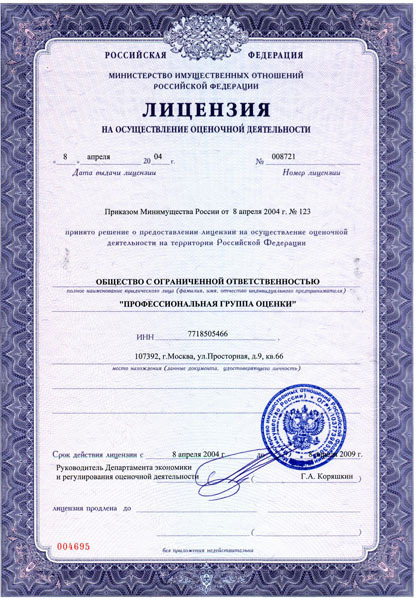 Professional Group of Appraisal was established in 2004 by professional valuers who hjoined forces to share and expand their knowledge to better serve the clients in valuation of property of any type for the largest state and private structures throughout Russia. Since 2004 on, the business and professional communities recognize Professional Appraising Group LLC good reputation of a reliable valuer. Our employees have rich experience in practice, each being a true expert in his or her professional area: valuation of intangible assets, valuation of business, valuation of investment projects, valuation of real property, valuation of equipment or transport vehicles. We take pride of the fact that our professionalism is equally oriented towards tackling complex tasks the large business face (buying stock out, contribution to the charter capital, business mergers, stock lending, making decisions regarding investment projects, contesting the cadastral value) and also private interests of small businesses and individuals (buying municipal real estate out, accession to the heirship, separation of property, pledge). Our main objective is not only to satisfy all expectations of the clients but also exceed them and to deliver to the client the professional valuation report of the ever higher level, and to resolve all tasks of the client. We are passionate about such relations with the client, which usually develop into the long-term cooperation or partnership. We take pride of our established clients and business partners. Our relations are based on mutual trust, respect and client-tailored approach. Our many-year relations with the clients are marked by the constantly improved quality and level of our services. Our principle is to remain in close contact with the client. Each client has a personal manager. In the course of the valuation works the client is informed about all details required and has an access to the interim results of our works. Our services fee will depend exclusively of the complexity and scope of the works performed. We enjoy an effective approach towards management of the resources and personnel thus making possible a significant reduction in costs and terms that are general for the valuation market, thus resulting in keeping our costs on an average level and higher level of services provided to the clients. We highly appreciate each client!